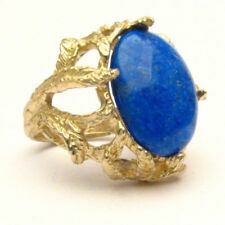 Sundance Ring from Sundance Catelog, Blue, Silver. Condition is Pre-owned. Shipped with USPS First Class Package. Currently this item is not in the catalog. Pretty ring and goes with everything. The lovely gemstone is surrounded by a intricate sterling silver swirly design. This beautiful ring has a bold design. WEIGHT- 9.1 grams of solid sterling silver and tested for sterling silver. It is very impressive and looks fabulous on the hand. Labradorite Trinity Ring. A trio of labradorites crowns the finger, the better to delight in the gem's flashes of iridescence. 18kt gold plated sterling silver. Ring size 7. Condition pre owned in excellent condition. These are made from real coins and retain the coins designs on the outer edge as well as the inner. These will be custom made. Message me the size you want We make these by hand in out house. They are comfortable to wear with no sharp edges. They are not cheaper bulk run made rings! A small hole is pressed out of the middle and then they go through a series of heating, quenching, folding, shaping, filing, sanding, sizing, and polishing. Making coins into jewelry is legal as it is not being altered with the intent of counterfeiting. Think of the penny squisher machines at amusement parks and such. We also make these out of other coins as well, check out our other listings! Genuine turquoise. Size 7(see sizer pic). Outlander Wedding Ring - Celtic Knot - Thistle -. Shipped with USPS First Class Package. Made in China. Makes great cosplay accessory or even as a nice, simple work or evening out accessory. Size 7 - New with Box, but no tags. Ring is too small for me. Ring--sz 7--Large BAND with Turquoise in Sterling Silver! New item! A genuine Turquoise in sterling ring, size 7: However, made in the Philippines--has a South Western Design. Clear Crystal is 3/4” x 3/4”. 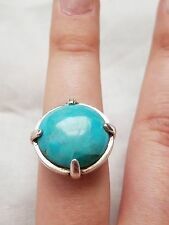 Up for sale is this huge Turquoise & 925 Sterling Silver Artisan Ring, Size 7. 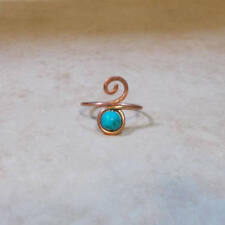 It's a beautifully handcrafted Artisan Turquoise Ring. Hallmarked 925 Sterling Silver. New ListingLilly Barrack Sterling Silver & 14k Gorgeous Blue Stone Ring Size 7 1/4"
Genuine rose quartz. Top of ring is 1.5” long. These are made from real coins and retain the coins designs on the outer edge as well as the inner. These will be custom made. We make these by hand in out house. They are comfortable to wear with no sharp edges. Handmade Taxco Silver And Pearl Women’s Ring From Novica. Condition is Pre-owned. Modern and elegant design featuring two white pearls by Alon Diller. .925 sterling silver. 4 mm band width. Crown/bezel: .5” H x .6” W x .2” D. Original retail price was $113.95. O ne Druzy is Green in the center. The other Druzy is Yellow and Green.Both are Raw ,Handmade Rings.Very Cool Rings! GORGEOUS HANDCRAFTED LABRADORITE RING FROM QVC. NEVER WORN,SIZE 7 1/2". WEIGHS 10.6 GRAMS.STAMPED INSIDE. 925 / INDIA.VERY WELL MADE FROM QVC. MY PERSONAL RING. Genuine African Opal. 92.5 sterling silver with a tiny bit of bronze. Top of ring is about 1” square. 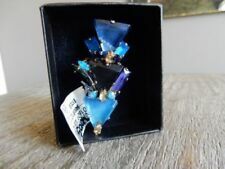 Gorgeous- I have a couple other pieces that work with this! Sundance Catalog Ring - Size 7. 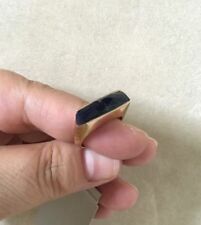 Two-toned ring. Condition is Pre-owned. Shipped with USPS First Class Package. Beautiful two-toned sterling silver ring from Sundance catalog. A band of textured sterling silver with gold edges. Lovely wedding band or just an everyday ring. 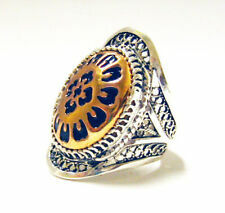 Silpada R2866 Midnight Star Sterling/Lapis/Crystal Ring, Size 7. Condition is Pre-owned. Shipped with USPS First Class Package. Molon Abe coin ring crafted from a. 999 1 ounce silver ring. Size 8- (See sizer pic). BALI DESIGN. LARIMAR RING. SET IN STERLING SILVER. Mayan Calendar coin ring. Made from pure.999 copper coin. Good luck ring. Mayan Calendar coin ring made from a pure copper coin. Can be antiqued as in picture or polished to a shine. Great for good luck. Hand crafted to your size. Crafted from a. 999 pure 1 ounce silver coin. "Eternal Vigilance" on the interior. THIS RING HAS BEEN HANDMADE USING A BEAUTIFUL, 16MM X 12MM AVENTURINE STONE AND 10 GAUGE STERLING SILVER WIRE FOR THE BAND. THE RING IS A SIZE 7. THIS IS SOLID STERLING SILVER. Pictures do not represent actual size. Condition is excellent Pre-owned, "as is" with no warranty from Silpada. SilpadaSterling Silver Ring - size 7. Filigree and Bone colored stone.